Beautiful piece for a key ring. 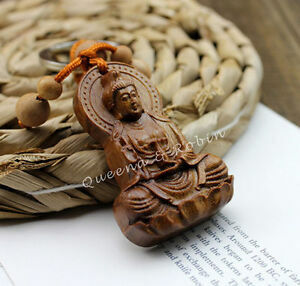 You can remove the ring and possibly wear around you neck as amulet decore. Has a beautiful carved figer. Quan Yin. A Buddhist saint. Very detailed. The cord is a copper color with wood beads and is pretty strong. Also has carved on the back what I think are Tibetan gliffs. How this was done perhaps advanced CNC. Pretty nice looking key ring. Peça muito bem acabada, material resistente e bonita. Recebi corretamente.